LLEIDA CLIMBS: Lleida Climbs 2nd Edition! It depends where you are. We only received the guide from the printer this week so it will probably take a few days to work through to the outlets. Let me know where you are based and I'll tell you the easiest way to get hold of a copy. Of course, if you're in Spain you could always order online from Desnivel.com — they should be able to start dispatching books by Monday. I found a supplier in the UK, cordee.co.uk, we don't visit lleida til Christmas so hopefully the book will arrive here in good time. Thanks, and can't wait to get out there. We will also have copies on sale in Abella de la Conca refugio from early December eventhough the refugio will only properly open in March 2014. Glad you got sorted Seb. 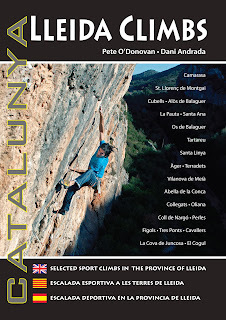 Lleida is a superb climbing area — you'll have a blast. Cheers guys, I'm looking for somewhere very basic and cheap to stay around Tremp. I don't suppose you could recommend anywhere please? Hostel style dorms would be more than adequate. Thanks. I've just put some more links on the 'Accommodation' page of this blog. The choice and price depends mostly on how many people will be in your group. For four people or more, renting a rural house or cottage is probably the most cost efficient, whereas for climbers traveling alone, hotels, refugis, etc., will probably work out cheaper. If we mainly climb 5a-c and have a 3-5 days, I'm assuming that it'd probably be best to stick to a single area. Would you recommend getting the Lleida or Tarragona guide book? Yes, for that length of time you're probably better sticking to a small group of cliffs in just one of the areas. If this is a first trip I recommend basing yourselves somewhere near the zones of La Mussara, Mont-ral, La Riba and Arbolí in Tarragona province, where you'll find plenty in the grade-range you've specified. I'm travelling from Barcelona airport to El Cogul (tomorrow), where would be the best place to buy this book? Thanks. If you're driving you'll most likely go through Lleida capital. If that's the case then call in at Decathlon, they should have the book. We left a few copies of the new edition in Camping Organyà, which is 15-20 minutes north of Oliana. Bakery 'Rosa Serra' in Artesa de Segre (fantastic sweet and savoury products!) also has the new guide. Enjoy your stay in Catalunya. PS. I forgot: also available in the bar 'El Portal' in Organyå — closer than the campsite. Hi, we have the 1st edition and we wonder if it's worthy to get the 2nd or to wait for the 3rd one...so, is a 3rd edition coming and when? p.s. great job with the book and the routes! Many thanks for your positive comments about Lleida Climbs! Lleida Climbs 2 has quite a lot of new sectors and routes, especially in Camarasa, Terradets and Coll de Nargó. It also includes the nice zone of Figols, which didn't appear in the first book. One thing's for sure — Lleida Climbs 3 won't be published for at least 2 or 3 years. I was on vacation at Coll de Nargo last week. With buddies, we climbed to the sector "Tranquil" (page 308 of the topo) Saturday, December 03. Buddies went in the "Sunset" route (7a +), which must be new because it is not in the topo. They told me there was a large, unstable block (big hold), which was about to fall. According to them, this represents a piece of about 100kg. I think you should purge that block, because it seems very dangerous. Thank you for taking this into account and a big thank you for the topo and all the work done, it is really top! Hi Vincent, Thanks for letting me know about this, but as I didn't clean or equip this route (I haven't heard of it before so, as you say, it's probably recent) it's not really my place to remove the block. I will contact one of the local equippers and tell him about the problem — hopefully he can get a message to the original ascentionists or maybe have a look at the block himself. Glad you like the book and good climbing here in the future! Happy to provide you with further details (e.g. the real position of the stands), if needed! Many thanks for getting in touch about this. I haven't done Eclipse — the original info came from a (usually) very accurate and knowledgeable local. However, after a few minutes searching on the web it seems that you're entirely correct — the line for the third pitch as marked in LC2 is actually a variant called 'Boira' and is, indeed 7a. The 'normal' route climbs easy corners to the right. I have to rush out now but will add something to the blog later, also mentioning that the first belay may be missing. Thanks again! ¡Hola! Tenemos alojamientos turísticos en Balaguer y Linyola en los que se alojan muy a menudo escaladores. Por este motivo nos encantaría saber si pueden añadirnos al apartado de alojamientos. Hem obert una casa de turisme rural a Toló, a prop de vilanova de meia, en la qual oferim habitacions dobles o triples i tambe esmorçars i sopars. Si es del vostre interes de incorporar ho al vostre bloc estarem encantats. Disponible en Angles, frances, catala i castella. Querría saber si hay fecha para la nueva (3a?) edición de la Lleida climbs.